July 18, 2016 – This week, we strapping our time machine to a canal boat, and sail down the modern marvel of early American commerce: The Erie Canal. The 360-mile slash between Lake Erie to Albany, and down the Hudson River to New York Harbor isn’t just one of engineers and back-breaking, dangerous manual labor, but of fascinating human drama and America itself. 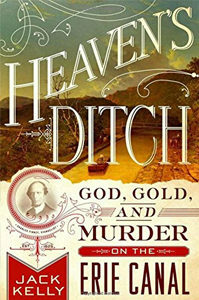 The book is Heaven’s Ditch: God, Gold, and Murder on the Erie Canal . By the time the canal opened 1825, the nation had fallen in love with this man-made waterway. Now, you can fall in love with it, too, thanks to Jack Kelly — journalist, novelist, and New York Foundation for the Arts fellow. His previous books include Band of Giants , which earned the Daughters of the American Revolution’s History Award Medal. You can see him everywhere from the Wall Street Journal to the History Channel, or by clicking over to HeavensDitch.com.